UNC is used to Final Four pressure- can Oregon keep up? 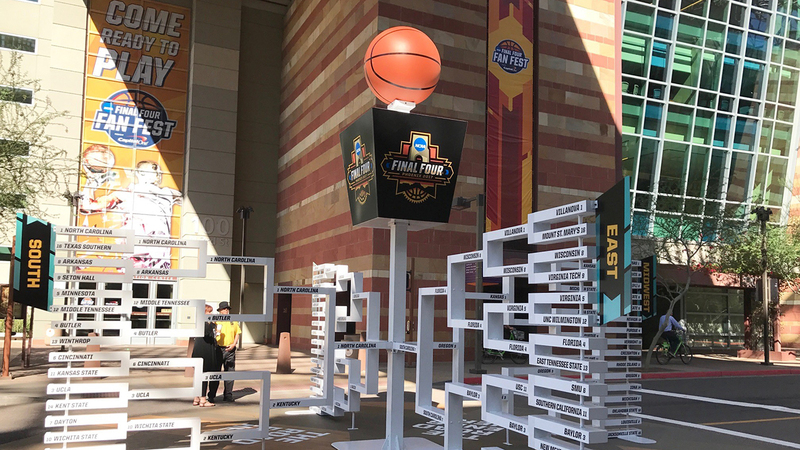 PHOENIX, Arizona (WTVD) -- Nobody has been to more Final Fours than UNC - a trip here to Phoenix makes it an even 20! The Tar Heels may be the most frequent Final Four visitor, but Oregon (like Colonel Sanders) is the original. The Ducks played in the first championship game in 1939. They beat Ohio State in that game. Oregon players celebrate with coach Dana Altman after a Midwest Regional final against Kansas in the NCAA men's college basketball tournament, Saturday, March 25, 2017. The Ducks are very talented. When the season began, Oregon was ranked ahead of Carolina. Then, they promptly lost two of their first four games. Star Dillon Brooks was hurt during that stretch. Months later, Chris Boucher went down injured for the season. Yet, they've overcome the hardship to earn Midwest regional hardware. The Heels must match the effort of Jordan Bell. The junior shot-blocking specialist grew up a Carolina fan, and he's playing as well as anyone this side of Luke Maye. Bell nearly had a triple-double in the Ducks' win over Kansas. Kennedy Meeks and company will have to body him up every trip. Like seemingly every college hoop game these days, it could come down to threes. Given the cavernous setting inside University of Phoenix stadium, that could be advantageous to UNC who relies more on offensive rebounding to score. There's going to be a lot of rebounding. Still should be a great game! !